From etouffée to the Beer Garden, attendees had so much from which to choose. Photo courtesy of the New Orleans Public Library. The more than 75 restaurants and concessions stands at the 1984 Louisiana World’s Fair offered a wide variety of food and drinks. Louisiana flavors were in abundance, offering tourists tastes of etouffée, jambalaya, gumbo, boudin, Creole shrimp and Natchitoches meat pies. Also available was standard American fare such as hot dogs, hamburgers, popcorn and pizza. International flavors were well represented in the foreign pavilions; visitors could try fiery Schezuan dishes, Tandoori chicken, Philippine noodles, Belgian waffles, croissants, plantains and more. For many New Orleanians, the Japanese Pavilion provided them with their first taste of sushi. Other rumored firsts offered to New Orleans at the fair included Frito pie and Mango Freeze, as well as Jaegermeister, available at one of the most popular sites at the World’s Fair: the Miller German Beer Garden. Located in the Federal Fibre Mills Building on St. Peters Street, the Beer Garden offered many selections of German food, including bratwurst, sauerkraut, marinated herring, pretzels, Black Forest cake, strudel and a very highly praised pig knuckle, as well as a large selection of imported and domestic beers. However it wasn’t just the menu that kept people coming back to the Beer Garden. From 10 a.m. until 2 a.m., the nonstop party featured live Bavarian bands playing oom-pah music and free “chicken dance” lessons. Weekly Saints pep rallies included Saints players and coaches and were broadcast on WWL radio. The 1,000-seat Beer Garden proved to be so popular that it was reopened after the fair closed, offering daily lunch and dinner, nightly live entertainment and a $9.95 Sunday all-you-can-eat brunch accompanied by a live German band. While it outlasted all other fair-based restaurant-bars, it closed in May of 1985 due to lack of business. Note: This is Part 3 of a yearlong focus on the 1984 Louisiana World’s Fair. The beer stein-shaped menu for Miller Beer Garden. 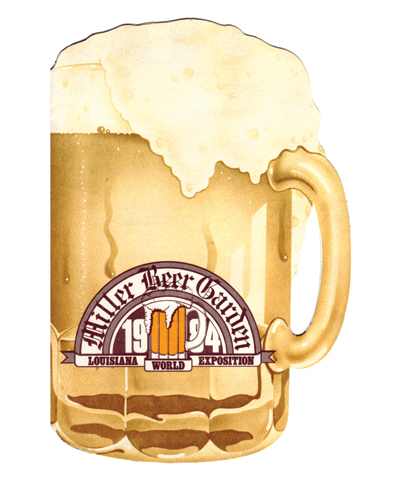 Miller High Life was the Official Beer of the 1984 World’s Fair and was offered on draught at the German Beer Garden, along with four types of schnapps: mint, chocolate, strawberry and Jaegermesiter.